Shopping and celebrations…..it’s not a bad life! So, it’s my favourite time in the buying calendar, the beginning of a new seasons’ development, and our designers are busy being super creative, pulling together colour palettes and story boards for AW13, whilst the buying teams are frantically pulling together samples and negotiating prices on the final phase of SS13, in preparation for sign off presentations. We’ve been out shopping for inspiration all over London this week, from the boutiques and markets of Portobello, to the high street and top end stores and brands, and trawling through the fashion magazines and trend websites, to kick start the creative design process for the season. It’s the “purest”, most creative phase in the buying process, before it all gets polluted with the price negotiation, quality and delivery issues involved in getting each product from concept to store! Everyone is full of excitement and optimism about the new season, looking at ways to grow sales and develop potential. A good time then, to celebrate the summer with a party, which is exactly what we did this week, on a river boat on the Thames. 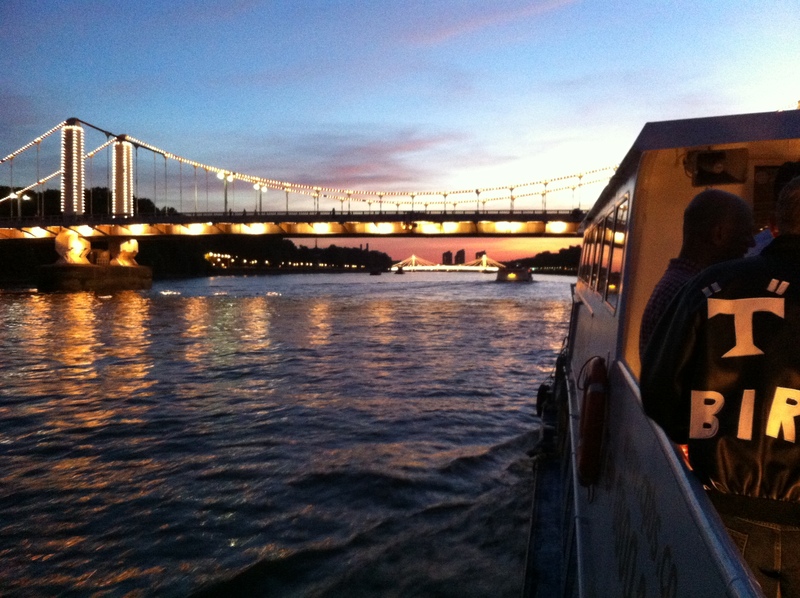 The weather was amazing, the sunset spectacular, and we had a very privileged view of some of the most amazing sights in London as we made our way along the river. With all the excitement of the Olympics and Paralympics surrounding the city, London is buzzing, and the atmosphere was great as we drank and danced our way into the night. Everyone was decked out in “Grease” paraphernalia, with numerous pink ladies jackets, fifties circle skirts, silly wigs and glasses, t-birds leather jackets and some very tight trousers. Cue a great deal of very bad singing and dodgy dance moves, made all the more interesting by the rocky boat and slippery dance floor! Back to the office on Friday,and a number of people were complaining of motion sickness (I suspect it might have had more to do with the alcohol consumption!). Having worked our way through a few supplier meetings, it was on to a very successful sign off on our teen girls range – having put so much effort into an overhaul of this department and the product, I am very proud of what the team have achieved so far, and I am really excited about the potential to dramatically improve the sales and profit on this area. This week I’ll be in Turkey with the girls and teens teams, looking at new fabric developments and products, filling the last remaining gaps in our AW12 and transitional ranges. I’m really looking forward to spending a little quality time with the buyers, designers and suppliers! With a little luck we might also fit in one or two lively nights out in Istanbul – it’s a city I always look forward to visiting, an amazing blend of cultures and glamour! This entry was posted in Uncategorized and tagged buying, design, London, Thames. Bookmark the permalink.